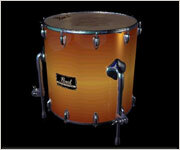 Standard size 10" x 8"
The hi-tom, is a drum with skins on both sides of the drum. You play the top head, known as the ‘batter head’. The sound from a tom is generally rounded as the shape of the drum is such that the two skins resonate together to produce the same tone. Tuning is very important. In the majority of instances the bottom head should be the same tension as the top head. 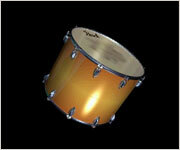 You can vary the tensions between skins, but this will effect the decay of the sound, after the drum has been struck. If the bottom head is looser the sound will drop. If tighter it will rise. Standard Size 12" x 10"
The concept of the mid-tom is the same as the hi-tom, except that it is usually slightly bigger and as such has a deeper sound. The hi-tom and mid-toms are often referred to as ‘rack toms’, as they sit either on or over the bass drum using a rack stand. The floor tom is the lowest pitched tom. 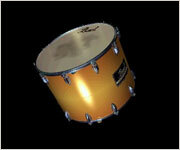 It is called a floor tom as it often comes with legs that sit the tom on the floor. More modern versions of the floor tom now actually hang the tom from a stand and are called either ‘hanging’ or ‘lo-toms’. They are all the same though in essence.